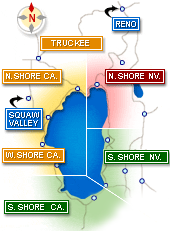 Browse the Top Lake Tahoe Bike Paths, Rental Shops and Bike Parks by Region & Rating! Go mountain biking in Lake Tahoe at Northstar, and have the time of your life! Rent 6-speed cruisers, 7-speed townies & cruiser tandems, 21-speed mountain and off-road mountain bikes! 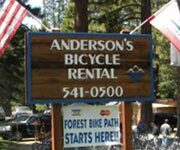 Below are a couple great Lake Tahoe bike services offering rentals and tours to both experienced and inexperienced bikers. During the summer, Lake Tahoe is the perfect place to bike. Between the rugged Lake Tahoe mountain biking, mellow trails and lakeside cruises, there is something available for all ages and skill levels. Factory Bike - Squaw Valley, Tahoe City, North Lake Tahoe and Truckee's premier bike rental and repair shop. Rent (or buy!) 6-speed cruisers, 7-speed townies, 7-speed cruiser tandems, 21-speed mountain bikes and 21-speed off-road mountain bikes! Factory Bike provides kid friendly rentals as well and little two-wheeled trailers for the little ones who can't ride yet. Wanna Ride Tahoe Bike Tours - Located in South Lake Tahoe, Wanna Ride Tahoe Bike Tours offers reasonable shuttle services around Lake Tahoe as well as affordable bike tours based on experience level. 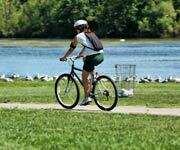 They have family packages, which can accommodate small children, and they also offer bike rentals for those who wish to make their own adventure. Check out Squaw Valley Mountain Bike Park for some of the best mountain biking Lake Tahoe! Lake Tahoe mountain biking is some of the best of the West! During the summer, all the snow covering the top Lake Tahoe ski resorts has melted away leaving a mountain scraped with beautiful trails. Most of these ski resorts open their runs to mountain bikers seeking a thrill and a half. Below are a couple popular mountain bike parks in Lake Tahoe, which are essentially snowless ski resorts. Besides the mountain bike parks, there are tons of bike trails scattered around Lake Tahoe ranging in difficulty and scenery. Northstar at Tahoe Mountain Bike Park - Find everything you need at Northstar Mountain Bike Park where you will discover the best mountain biking Lake Tahoe. 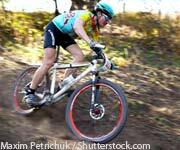 They offer package deals as well as mountain bike classes for beginners. The best package is the "Stay & Bike FREE," which includes lodging, two all-day biking lift tickets as well as two $10 food coupons. This inclusive package is great for a weekend getaway. Squaw Valley Mountain Bike Park - Squaw Valley is a beautiful place to visit during the summer, and definitely a must for anyone who has never mountain biked before. Interestingly, the trails at Squaw Valley Mountain Bike Park were part of the inspiration for Disneyland's Thunder Mountain roller coaster. If you plan on biking Lake Tahoe, check out Squaw Valley Mountain Bike Park. The best Lake Tahoe mountain biking south of the Lake! Welcome to Tahoe's Best web resource for  cycling and  mountain biking in beautiful North, South, East and West Lake Tahoe! 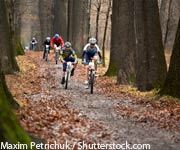 Here you will find  great family fun on our local bike paths, find out about the best road trips to be had and learn about our mountain bike parks. We also provide you with a touring checklist to prepare you, information on places to rent and service your equipment and a description of a couple of  our favorite rides. Check out these downloadable and printable trail maps for Lake Tahoe! 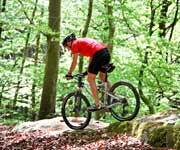 Fly Down The Mountain On An Exhilarating Bicycle Ride. Wanna Ride Tahoe Bikes South Lake Tahoe is a Custom Tailored Bike Ride! The Bicycle Paths are open between Memorial Day and Labor Day Weekend for Lake Tahoe mountain biking. Use is generally longer, at your own risk. The Tahoe City Public Utility District and Caltrans do not maintain the paths during the winter months. The trails become usable after one or two months of warm  weather at lake level. Official opening will be posted when available. All bike paths have received TLC from the TCPUD, please enjoy. Lake Tahoe's normal mountain biking season usually runs from July through November.